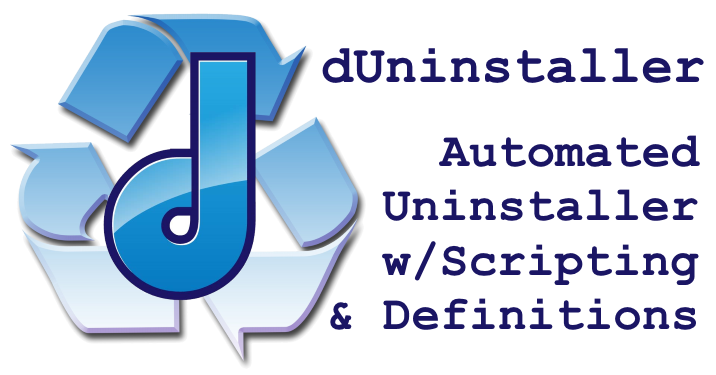 dUninstaller is stand-alone, portable, definition based automatic application uninstall utility. dUninstaller utilizes a definitions system containing search terms, and the ability to run automated/silently uninstalling what it can, and reporting what it cannot uninstall automatically, as it can generate a log file and/or send an email with the results. The intent of dUninstaller is for PC repair technicians to script its usage, or for other IT providers and MSPs to push out via group policy to workstations or to managed PCs from remote monitoring / managed services software such as Kaseya, nAble, Level Platforms, GFI, etc. etc. Run dUninstaller.exe normally to manually view installed applications, uninstall them, and/or add them to your ‘definitions’ for automated removal. Add any partial search term to your definitions to uninstall matching items, e.g. “toolbar” will uninstall EVERYTHING with “toolbar” in the name. New in v2.0! Add any partial search term to your whitelist. Example: now you can blacklist “toolbar” and whitelist “bing” and “google” to uninstall any toolbars that don’t have bing or google in the name. Run dUninstaller.exe /auto from a command prompt or script for automated/silent removal of items in your definitions, excluding any items matching your whitelist. New in v2.0! Run dUninstaller.exe /u=App Name To Uninstall to bypass definition files and remove any app matching that search string. dUninstaller /update will update the app itself from my website before running any other passed command line parameters. dUninstaller /fixbrowsers will fix web browsers not launching on the chance that dUninstaller stalls while removing an app and is terminated before it can process the command to restore browser functionality (browsers are disabled while dUninstaller runs so that it can deliver a hassle free and automated uninstall.) It is always recommended to put this last in your scripts. Generate Log Files with Results. Automated Email with the Results. Automated/Scripted Retrieval of Updated Config/Definitions. * NOTE full uninstall automation is not guaranteed with all applications. Some program uninstallers may require user input to complete. dUninstaller reads the section of the registry where installed applications are registered with Windows. Within these registry entries is an “uninstallstring” value that tells Windows (via Control Panel) how to uninstall the application. With any luck, there is ALSO a “quietuninstallstring” value, which allows for silent /automatic uninstall. THAT is where dUninstaller’s usefulness comes into play. It reads the quietuninstallstring (if present) and executes that command. If the quietuninstallstring is NOT present, dUninstaller will pass the /quiet /noreboot parameters to MSI based installers, the /sp- /silent /noreboot parameters to Inno Setup based installers, and /S for all other installers when running the uninstall command, which should do the trick. Note sometimes using this method causes certain installers to throw an invalid parameter or similar error – though this has been rarely reported. Once you purchase dUninstaller, you own the rights to use it on as many of your clients’ computers as you like. You may NOT distribute your registered version of dUninstaller or registration information for dUninstaller to those outside of your employment. You may NOT redistribute the registered version of this application to any 3rd party torrent/download sites, etc., however you may host the application on your own web space for the sole purpose of providing it for your and your employees usage outside your place of business. Any use of this software requires that you accept the fact that only you are responsible for anything you do with any software, including this app, which comes with no warranties or guarantees of any kind. You bear sole responsibility for any use or misuse of this application and for any resulting damages. Added encryption of registration and all non-numeric email settings. Codejock control for some visual elements was updated from 15.3.1 to 16.4.0 and bundled with the update package. Note you DO NOT have to deploy the Codejock OCX file if you are using dUninstaller.exe in a scripted environment only with no user interface. Fixed an issue with data loss affecting the saving of file/registry deletion definition lists when edited via the dUninstaller UI. Fixed an issue where the whitelist would not be processed if a blacklist did not exist. Fixed: Uninstall Now button was uninstalling items that were highlighted in the list in addition to items that were checked off in the list. Added capability of whitelist/blacklist to match against publisher/mfgr names and not just app names. Added internal update functionality!! No more downloading updates from the website. Added new /update command line parameter to auto-update itself before running other command line parameters passed to it. Fix for the /auto parameter not working as expected under certain circumstances.